To achieve energy self sufficiency, the ZEB is powered by a broad spectrum of solar panels installed at many locations in the building. It is 100% clean renewable energy. The generation of solar power can be broadly divided into 2 parts. Grid tied photovoltaic account for most of the solar panels and is connected to grid supply. 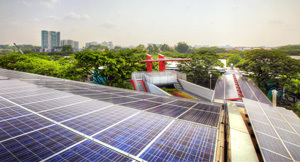 Surplus power generated by these solar panels would first be distributed to the rest of BCA Academy before any excess is supplied back to the grid. If insufficient power is produced, then grid supply will provide for ZEB, so that user comfort and function are never compromised. 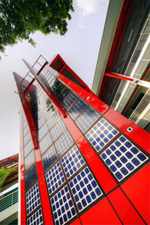 Standalone photovoltaic are not grid connected and supply power directly to specific functions in ZEB such as the visitor centre solar charging kiosk. Solar cells produce direct current electricity from light, which can be used to power equipment or to recharge a battery. The first practical application of photovoltaics was to power orbiting satellites and other spacecraft, but today the majority of photovoltaic modules are used for grid connected power generation. In this case an inverter is required to convert the DC to AC. There is a smaller market for off grid power for remote dwellings, roadside emergency telephones, remote sensing, and cathodic protection of pipelines. Cells require protection from the environment and are usually packaged tightly behind a glass sheet. When more power is required than a single cell can deliver, cells are electrically connected together to form photovoltaic modules, or solar panels. A single module is enough to power an emergency telephone, but for a house or a power plant the modules must be arranged in multiples as arrays. 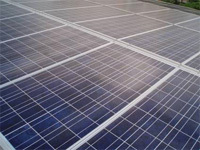 Characterized by large-area, high quality cells based on silicon wafers (monocrystalline and polycrystalline).